Remember, even if you don’t see how things could ever work out, God does. 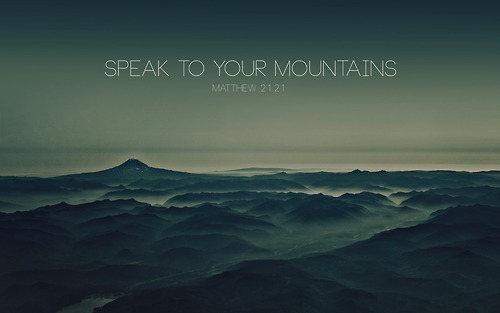 You’ve got to speak His Word over those mountains in your life and declare favor over those situations. Instead of talking to God about how big your problems are, talk to your problems about how big your God is! As you speak to your mountains, they will be moved, and you will walk forward into the victory God has prepared for you! Father, I declare that I can do all things through Christ who gives me strength. I speak to the mountains in my life and say, “Be moved!” I declare blessings, favor and victory over my future in Jesus’ name. Amen! God has a plan to take every adversity, every hardship you go through and use it–not to beat you down and make your life miserable. No, God’s dream is to take that difficulty and supernaturally turn it around and use it to bring you good. He will use those tough times to bring you out stronger, more mature, and prepared for promotion! Goodness, mercy, and unfailing love are God’s plan for you! You may not understand everything that’s going on in your life right now, but I encourage you to keep your head held high. Know that God is working in your life. Keep being faithful. Keep doing the right thing knowing that in the end God is going to turn things around in your favor. If God is for you, who can be against you? No one. Greater is the One who is in you than anyone who can be against you. No matter what’s going on around you today, you can put your shoulders back and put a smile on your face because God has good things in store for your future! 1. LOVE – Lord, help us follow the way of love – let the love of Christ compel us (1 Corinthians 14:1; 2 Corinthians 5:14). 2. JOY – Restore the joy of Your salvation to us; let us experience the joy of Your presence (Psalm 51:12; 16:11). 3. PEACE – Let Your peace rule and guard our hearts; give us more of You – You are our peace (Colossians 3:15; Philippians 4:7; Ephesians 2:14). 4. HOPE – Enlighten the eyes of our heart so that we may know the hope You called us to (Ephesians 1:18). 5. FAVOR – Let Your favor rest on us (Luke 2:52). 6. LIFE – Shine Your light of life on us; help us to walk in it (Job 33:30; Psalm 56:13). 7. SALVATION – Help us to fear You so we can unlock the treasure of Your salvation (Isaiah 33:6). 8. SELFLESSNESS – Keep us from self-seeking attitudes that reject truth (Romans 2:8). 9. GENEROSITY – Make us rich in ways that result in generosity on our part so You will be praised (2 Corinthians 9:11). 10. RECEIVING – Help us receive Your kingdom, Your Spirit, and Your grace (Daniel 7:18; John 20:22; Romans 5:17). 11. SEEKING – Encourage us to seek Your face with all our hearts (Deuteronomy 4:29; Psalm 27:8). 12. PRAISE – We ascribe glory to Your name, Lord; we come before You in worship for You are holy (1 Chronicles 16:28-29). Everyone goes through seasons of difficulty or times when things just seem dark. During these challenging times, know that you are not alone. God has a plan to drive out the darkness—He will flood you with His light! Notice that in today’s verse it doesn’t say, “The light will come trickling in.” No, it says that the light will come bursting in! That means suddenly, you will see God’s goodness. Suddenly, you’ll be promoted. Suddenly, the answer will come! If you’ve been going through a difficult time, get ready for the goodness of God in a new way. Know that His light is about to come bursting in! Get ready for breakthroughs. Get ready for promotion. Get ready for restoration. You may have had that problem for a long, long time, but today could be the day that it turns around. Suddenly, things can change! God wants His glory to be seen on you. He wants you to stand out in the crowd. He wants you to be so blessed that everyone around you can see His goodness on you! So keep standing, keep believing, keep hoping and keep declaring His Word because His light is going to come bursting in! “So let’s not allow ourselves to get fatigued doing good. At the right time we will harvest a good crop if we don’t give up, or quit” (Galatians 6:9, The Message). Everyone has God-given dreams and desires. We all have goals we want to accomplish and situations we are believing will be turned around. Sometimes it seems to take longer than we originally thought. Sometimes, things don’t work out the way we planned, and it’s easy to lose enthusiasm. If we’re not careful, we’ll get discouraged and end up just settling where we are. But God doesn’t want us to settle, He wants to take us higher. But many times, people miss out on God’s best simply because they give up too soon. They don’t realize how close they are to their victory. Friend, don’t let that be you today. Don’t give up just because things seem hard. You’ve invested so much, and you never know, just a few more days of believing, another few weeks of doing the right thing, another few months of staying in faith, and you could see that situation turn around. Remember, God is on your side! Keep standing and keep believing because you are closer than you think to fulfilling every desire He’s placed inside of you! “Oh, that we might know the Lord! Let us press on to know Him. He will respond to us as surely as the arrival of dawn or the coming of rains in early spring” (Hosea 6:3). God promises that He is near to those who call upon His name. It doesn’t matter where you are or what you’re going through; He is your deliverer. He’ll bring light into your darkest hour; He’ll bring rain into the dry places; He’ll bring restoration and healing to the broken places. 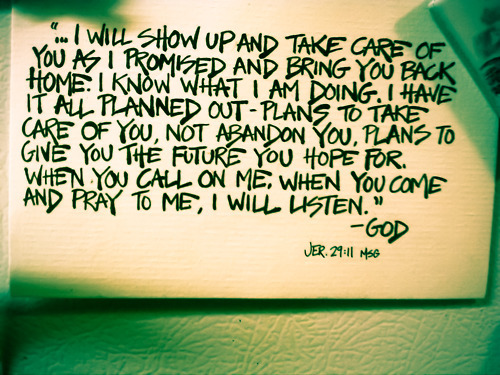 When you call on His name, you can be assured that He will respond. As sure as the sun will rise tomorrow, God will faithfully respond when you seek Him. Sometimes, people think they have to clean themselves up or change their behavior or habits before they can turn to Him, but that’s not what God says. He is ready to receive you just as you are. Even if you feel like a mess, He’ll take your mess and turn it into a message. His arms are open wide today. Open your heart and call upon Him. Press on to know Him and His goodness. “For the vision is yet for an appointed time…though it tarries, wait for it” (Habakkuk 2:3, KJV). As many of you know I am a author in my own right. I have published 4 book so far. And as sit this morning pondering should I be further along then where I was brought to the above familiar scripture; Habakkuk 2:3. God has an appointed time to fulfill the visions, dreams, and desires in your heart. Just because it has taken a long time or because you’ve tried and failed doesn’t mean it’s not going to happen. Don’t give up on those dreams! Don’t be complacent about pursuing what God has placed in your heart. Our God is a faithful God. No matter how long it’s been, no matter how impossible things look, if you’ll stay in faith, your set time is coming. Remember, every dream that’s in your heart, every promise that has taken root, God put it there. Not only that, but He has every intention of bringing it to pass. Hold on to that vision today. Declare by faith, “My time is coming. God is working behind the scenes on my behalf. I will fulfill my destiny!” As you continue to hold on to that vision and speak life over your dreams, it won’t be long before you see them begin to take shape. You’ll see your faith grow, you’ll see your hope strengthen, and you’ll see yourself step into the destiny God has prepared for you!